This class reads annotated topology and apply settings to the corresponding nodes and links. Definition at line 36 of file annotated-topology-reader.hpp. Definition at line 66 of file annotated-topology-reader.cpp. Definition at line 103 of file annotated-topology-reader.cpp. 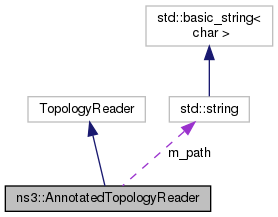 Main annotated topology reading function. This method opens an input stream and reads topology file with annotations. Reimplemented in ns3::RocketfuelMapReader, and ns3::RocketfuelWeightsReader. Definition at line 154 of file annotated-topology-reader.cpp. References ndn::time::abs(), ApplySettings(), CreateNode(), m_nodes, and m_path. Get nodes read by the reader. Definition at line 142 of file annotated-topology-reader.cpp. Get links read by the reader. Definition at line 148 of file annotated-topology-reader.cpp. Assign IPv4 addresses to all links. Definition at line 269 of file annotated-topology-reader.cpp. Definition at line 85 of file annotated-topology-reader.cpp. Set mobility model to be used on nodes. Definition at line 97 of file annotated-topology-reader.cpp. Apply OSPF metric on Ipv4 (if exists) and Ccnx (if exists) stacks. Definition at line 282 of file annotated-topology-reader.cpp. Definition at line 435 of file annotated-topology-reader.cpp. Definition at line 538 of file annotated-topology-reader.cpp. Definition at line 109 of file annotated-topology-reader.cpp. Referenced by Read(), ns3::RocketfuelWeightsReader::Read(), and ns3::RocketfuelMapReader::Read(). Definition at line 123 of file annotated-topology-reader.cpp. This method applies setting to corresponding nodes and links NetDeviceContainer must be allocated NodeContainer from Read method. Definition at line 327 of file annotated-topology-reader.cpp. Referenced by ns3::RocketfuelWeightsReader::Commit(), Read(), and ns3::RocketfuelMapReader::Read(). Definition at line 135 of file annotated-topology-reader.hpp. Referenced by CreateNode(), Read(), and ns3::RocketfuelWeightsReader::Read(). Definition at line 136 of file annotated-topology-reader.hpp. Referenced by CreateNode(), GetNodes(), Read(), ns3::RocketfuelWeightsReader::Read(), ns3::RocketfuelMapReader::Read(), SaveGraphviz(), and SaveTopology().